"I highly recommend Robin for a fun, care-free party! She made my twin girls 5th birthday party such a breeze for me. It was so super fun. The decorations was amazing (not my gifting! ), the snacks were great, and the party favors were perfect. Our favorite part was the face painting and the balloon art- wow! The kids were thrilled and giggly. They couldn't believe what she could do with balloons- Hello Kitty? A Unicorn? No problem! And full face face-painting- whatever they wanted. 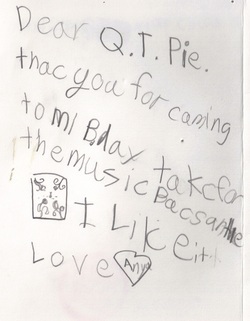 Robin made my girls and all the other kids (boys and girls) feel so special and giddy. What a memorable time! Thank you Robin!!!! I'll never forget it!" I have been meaning to reach out to you about how INCREDIBLE Tessa's 5th birthday party was, all because of you and your talent. Not only were you professional, friendly, and a pleasure to work with, but the skill you have with face-painting is impossible to beat. I could not stop taking pictures! Both the kids and their parents had a blast and everyone told me the party was the best one they had been to in a long time. I really appreciate you handling the majority of the planning and for being so accomodating to our needs. You make it look easy! "This is BY FAR the most AMAZING face painting I have ever seen, anywhere!" ~Comment from a mom at a recent party! Robin, Thank you so much! You are truly amazing. The girls LOVED the face painting and the parents were in awe when they came to pick up. You were wonderful! My sister and I loved everything about you and your company! No complaints. I'm glad everything went according to plan and you guys did an excellent job with all those kids! They all enjoyed their face paint and balloon sculptures! Thanks again for everything and I will definitely use you guys again for future birthday parties! 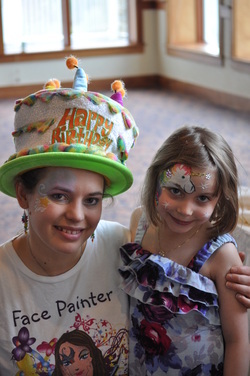 Thanks again for helping create such a fun party for (birthday girl) yesterday! Attached is best one of the pictures I took of you and (birthday girl) together. Hope you like it! Just wanted to thank you again for helping make our son's birthday party a memorable one on Sunday! Both the face paint and balloon art was fabulous. We'll definitely recommend you for future kids' parties if our friends are looking for someone. "Robin, I had so many compliments about your work - parents were thrilled! You did a marvelous job." Thank you so much for the amazing job that you did at our volunteer appreciation event! We really appreciated you doing a few extra kids at the end. You were both amazing!